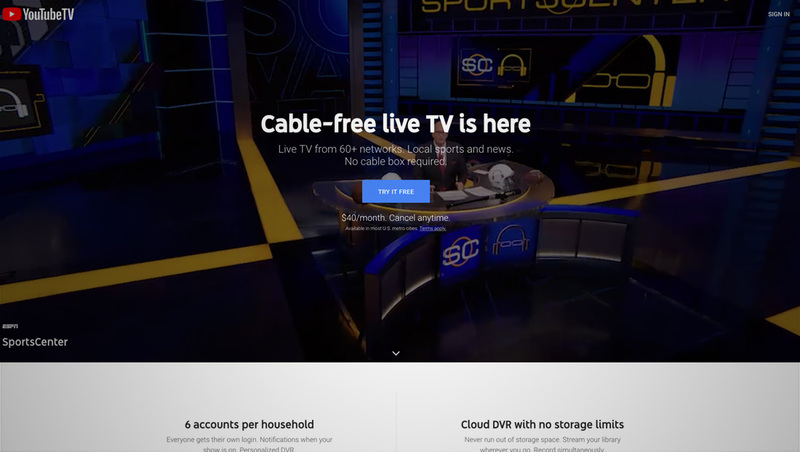 YouTube TV, which is Google’s self proclaimed “cable free” live TV offering can be a good choice for many television fans, but there are some caveats to be aware of. First, it’s worth noting that despite a “nationwide” rollout announced Jan. 28, 2019, the service only reaches 90 percent of the country, so you’ll need to check if your ZIP code is eligible first. In most markets, live streams of local ABC, CBS, NBC and Fox stations are available, which includes, in most cases, access to local newscasts and syndicated programming they offer, so that’s another point to consider. CW, MyNetworkTV and independent stations are also available in select markets. The service also includes some of the most popular cable networks, including CNN, MSNBC, Fox News, HLN, SyFy, USA, ESPN, TBS, TNT and more, but offerings vary by location. An April 2019 update added Discovery Channel, HGTV, Food Network, TLC, Investigation Discovery, Animal Planet, Travel Channel and MotorTrend — with OWN coming later in the year. If you’re fan of any of these networks, you’re out of luck for now. You should also be aware that YouTube TV, despite being billed as including “unlimited DVR,” is subject to some limitations. When viewing select programming, you may be forced to watch commercials — even if you’ve “recorded” the show using the DVR feature. On the other hand, YouTube does allow you to view select programs without setting them to record but typically with ads. In some instances, certain local programming may be blacked out. Sports fans should also note that YouTube TV is subject to local blackouts just like cable. Premium sports add-ons, available for an additional fee, can add additional sports coverage, but these networks may, in turn, also be subject to local restrictions. You’ll also need an Internet connection to use YouTube TV. In addition, you’ll also need a smart phone, tablet, smart TV or streaming box that’s compatible with the service.